If one of our resolutions for the New Year is to get to grips with the sky at night, then we could hardly do better than start with our January evenings. The unmistakable constellation of Orion the Hunter rises in the east at nightfall and is the centrepiece of a star-strewn region in the south-south-east by our star map times. On the other hand, most of the brighter planets, and what may be our brightest comet of 2016, are best seen in the morning sky. Just as last month brought the Geminids as the best meteor shower of 2015, so the imminent Quadrantids shower may provide our best display of 2016. Lasting from today until the 6th, but with most of its activity in the hours before dawn on the 4th, its medium speed meteors are seen in all parts of the sky but diverge from a radiant point below and left of the Plough’s handle. The Plough itself lies in the north at nightfall and climbs through the north-east and east to lie overhead before dawn. 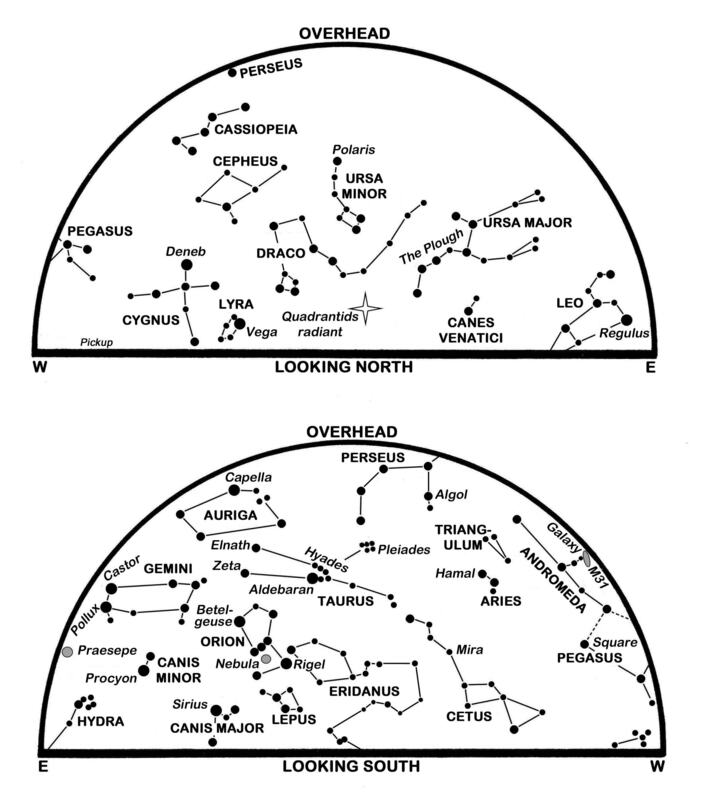 Most of the constellation figures show little relation to the things, persons or animals they represent. Orion is a striking exception, for he has conspicuous stars at his shoulders and knees and an iconic line of three stars to define the belt around his waist. Admittedly, his head is marked only by a knot of fainter stars, although if we look carefully we can find an arc of other faint stars to represent the shield he holds in the face of the charging bull, Taurus. Another line hangs below his belt to form his sword. Use binoculars or a telescope to inspect the sword and it is easy to spot the Orion Nebula, a cloud of gas and dust that lies some 1,350 light years away. This miasma of greens, reds and blues is a region where new stars are forming, together with their nascent planetary systems. The line of Orion’s belt slants downwards to the brightest star Sirius in Canis Major, the larger of Orion’s two dogs. Extend the line the other way and we reach Taurus with its leading star Aldebaran in and the Pleiades star cluster. As Orion sinks towards our western horizon early on the morning of the 20th, Aldebaran is once again occulted by the Moon. As seen from Edinburgh, the star disappears behind the upper edge of the Moon just before 03:24. It may be hard to believe, but the Earth is closest to the Sun for the year (147,100,176 km) when it reaches perihelion late tomorrow. Sunrise/sunset times for Edinburgh vary from 08:44/15:49 today to 08:10/16:42 on the 31st, while the Moon is at last quarter tomorrow, new on the 10th, at first quarter on the 16th and full on the 24th. Jupiter rises at Edinburgh’s eastern horizon at 22:39 tonight and two hours earlier by the 31st. Now in south-eastern Leo and already twice as bright as Sirius, it brightens from magnitude -2.2 to -2.4 this month and reaches a so-called stationary point on the 8th when its easterly motion reverses to westerly. If you did get a telescope for Christmas, then enjoy the view of its fascinating cloud-banded disk which swells in diameter from 39 to 42 arcseconds. Jupiter stood near the Moon last night and the two are even closer on the 28th-29th. Mars rises in the east-south-east by 02:15 and lies to the left of Spica in Virgo as they pass 25° high in the S before dawn tomorrow. The Moon is nearby on Sunday and even closer on 1 February, by which time Mars has travelled east-south-eastwards into Libra where it lies just above the double star Zubenelgenubi. Mars improves from magnitude 1.3 to 0.8 to overtake Spica in brightness, but is shows only a small 6 arcseconds disk through a telescope. Venus continues as a brilliant morning star (magnitude -4.1 to -4.0) though its altitude in the south-east at sunrise sinks from 15° today to 8° by the 31st. It lies to the right of the waning Moon on the 7th when a telescope shows its disk to be 79% sunlit and 14 arcseconds wide. Venus is just 2° to the right of Saturn on that morning and within 7 arcminutes of Saturn on the 9th. At magnitude 0.5, Saturn is much the fainter of the two as it creeps eastwards in southern Ophiuchus. Mercury has a few more days as a difficult evening star. It is bright at magnitude -0.2 tonight, but it hugs our south-western horizon at nightfall and sets less than 100 minutes after the Sun. As the month ends it is back in our morning twilight, a few degrees to the left of Venus. Comet 2013 US10 Catalina has remained stubbornly below naked eye brightness in our morning sky, though photographs reveal a striking divergence between its tails of dust and ionized gas, the latter being torn and billowed by the solar wind. Following perihelion 123 million km from the Sun in mid-November, the comet is closest to Earth (108 million km) on the 17th. Likely to appear as a small greenish fuzzy blob through binoculars, it moves from less than 0.5° west of the conspicuous star Arcturus in Bootes this morning to lie 1.2° east of Alkaid, the star at the end of the Plough’s handle, before dawn on the 15th. It is currently around the sixth magnitude but may be a magnitude dimmer by the month’s end as it sweeps within 9° of Polaris and recedes on a trajectory that will never bring it back towards the Sun. This is a slightly-revised version of Alan’s article published in The Scotsman on January 2nd 2016, with thanks to the newspaper for permission to republish here. Journal Editor’s apologies for the lateness of the article appearing here. Experience tells us that the coldest night of the winter is unlikely to occur during December, but the month does bring our longest ones as the Sun dips to its farthest south at the winter solstice, due this year at 04:48 GMT on the 22nd. Those long nights begin with Pegasus nearing the meridian but, by our star map times, its famous Square is in the south-west and our eastern sky has been claimed by the sparkling constellations of winter. Orion is unmistakable, his three Belt stars aligned almost vertically and pointing up to Aldebaran in Taurus and on to the Pleiades cluster. There is another occultation of Aldebaran by the Moon on the 23rd with the star blinking out at the Moon’s limb just before 18:18 as viewed from Edinburgh, and reappearing by 19:15. The Moon’s glare means that we will probably need a telescope to view the event. Sunrise/sunset times for Edinburgh vary from 08:18/15:44 on the 1st, to 08:42/15:40 on the 22nd and 08:44/15:47 on the 31st. The Moon’s last quarter on the 3rd is followed by new on the 11th, first quarter on the 18th and full on the 25th. Our evening sky remains devoid of bright planets at present, but the return of the annual Geminids meteor shower is ample compensation. Now regarded as our best meteor display, this is active from the 8th to the 17th with its peak predicted for about 13:00 on the 14th with meteor rates of perhaps 120 per hour for an observer under an ideal dark sky. This is, of course, during our daylight but, unlike some other showers, meteor activity remains high for more than 24 hours and the nights of 13th/14th and 14th/15th could both be memorable. Just be careful to wrap up well to get your fill of long, bright, medium-slow meteors. 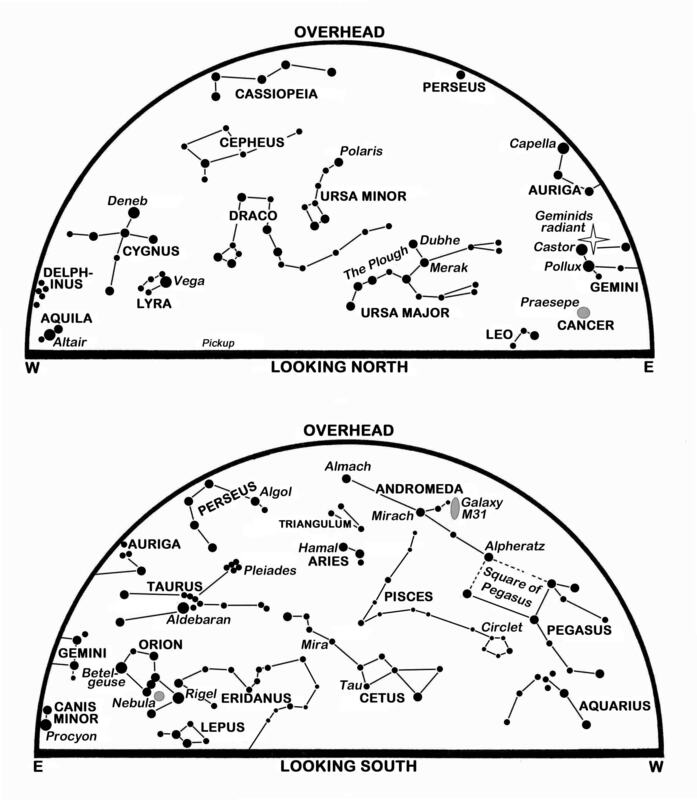 The radiant, the point in the sky from which the meteors appear to diverge, is plotted close to the star Castor in Gemini on the eastern side of our North map. Gemini lies north and east of Orion and as Orion marches across our southern sky so the radiant climbs to pass high in the south at 02:00. Remember that the meteors are visible in all parts of the sky, not just near Gemini – it is their streaks that point back to the radiant. As Orion crosses our meridian some four hours after our map times, so the first bright planet of the night rises in the east. Jupiter brightens further from magnitude -2.0 to -2.2 as it creeps 2° or four Moon-breadths east-south-eastwards in south-eastern Leo, some 20° below and left of the star Regulus. As the most conspicuous object in the middle of our southern sky before dawn, Jupiter stands just above the Moon on the 4th and to the Moon’s left on the 31st. By the month’s end, it rises more than one hour before midnight and its interesting cloud-banded disk has swollen in diameter from 36 to 39 arcseconds as seen telescopically. The night’s second naked-eye planet, Mars, lies 20° east-south-east (below-left) of Jupiter and just below the star Porrima in Virgo as the month begins. At magnitude 1.5, but improving to 1.3, it, too, tracks east-south-eastwards to pass 4° north of Spica on the 21st. Look for it close to the waning Moon before dawn on the 6th but don’t expect your telescope to show much if any detail on its tiny 5 arcseconds disk. The third planet is the brightest of all. Venus climbs above Edinburgh’s eastern horizon at 03:53 on the 1st and, at magnitude -4.2, may still be visible 25° high in the south-south-east at sunrise. It is then 4° north-east of Spica, but it speeds through Virgo and much of Libra so that, by the 31st, it rises in the south-east at 05:26 and is 15° high in the south at sunrise. As Venus recedes, its gibbous disk shrinks from 17 to 14 arcseconds in diameter. Its motion takes it 2° above Zubenelgenubi in Libra on the 17th and to within a similar distance of the Graffias in Scorpius on the 31st. Venus is occulted for observers over much of N America as it is overtaken by the Moon next Monday. Saturn, magnitude 0.5, emerges from the morning twilight to hover low in the south-east, below and to the left of Venus, during the final ten days of the year. On those same days, but in the evening, it might just be possible to spot Mercury as it shines at magnitude -0.5 some 5° high in the south-west only 30 minutes after sunset. Comet 2013 US10 Catalina is likely to be a binocular object as it climbs into our south-eastern sky before dawn. Thought to be an asteroid when it was discovered in 2013, hence its odd name, it was closest to the Sun (123 million km) on November 15 and is due to pass closest to the Earth (108 million km) on January 17. There has been speculation that it might become a naked eye object of the fourth magnitude or better. However, having spent weeks hidden in the Sun’s glare, it was a disappointing sixth magnitude object when it was recovered a couple of weeks ago. I fear it may not get much better than this, though the fact that it has two, or even three, tails will make for some interesting photographs. From 11° below-left of Venus as the month begins, it tracks almost due northwards to stand only 4° to the right of Venus next Monday (with the Moon nearby) and lie a mere 2° south of the bright star Arcturus in Bootes by the 31st. This is a slightly-revised version of Alan’s article published in The Scotsman on December 1st 2015, with thanks to the newspaper for permission to republish here.